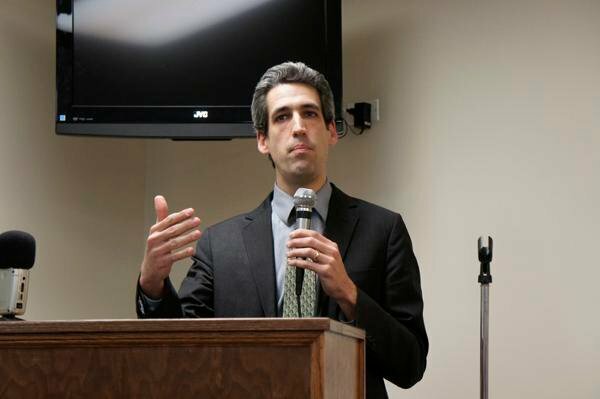 State Sen. Daniel Biss (D-Evanston) explained his bill to address Illinois' pension problem during a town hall meeting in Wilmette in early February. A labor coalition backed a state senate bill introduced Friday that proposes new revenue to fix the state’s underfunded public pension system. The We Are One labor coalition, which includes the Illinois AFL-CIO and the Illinois Education Association, backed Senate Bill 2404 following a coalition-hosted pension summit last week, which centered on raising taxes to pay off the public pension debt. State Sen. Linda Holmes (D-Aurora) and Sen. Pam Althoff (R-McHenry) introduced the bill, which would increase employee pension contributions by 2 percent. The state has $97 billion in unfunded pension liabilities that have accumulated over decades. The credit rating agency Standard & Poor’s downgraded Illinois credit rating to an A- last August because of the state’s underfunded pension system, making it more costly for the state to borrow money. McBarron said although blame from the public pension deficit remains entirely in the hands of the legislators, the coalition said their members were willing to contribute part of their salaries to dealing with the deficit. The coalition has opposed past pension reform plans, including one proposed by Gov. Pat Quinn, on the grounds they placed too great a burden on public employees. In a town hall meeting held this month, state Sen. Daniel Biss (D-Evanston) discussed his support for House Bill 98 and Senate Bill 35, which he sponsored. The bills would increase employer pension contributions and place a salary cap on employees. State Rep. Elaine Nekritz (D-Northbrook), House Bill 98 sponsor, called it a true bipartisan effort. Although the bill lost some support with the start of the new Illinois General Assembly, Nekritz said the bill still has momentum. Non-teacher school employees are covered by the Illinois Municipal Retirement Fund, the state’s second largest private pension system behind the Teacher’s Retirement System. The IMRF guarantees employees full pension funding and recorded more than $27 billion in assets in 2012. Evanston Fire and Life Safety Service chief Greg Klaiber said he would like to see pension reform discussion focus more on public safety. None of the current proposals would boost public safety, he said. Correction: A previous version of this story misstated who is covered by the Illinois Municipal Retirement Fund. Only non-teacher school employees are covered. The Daily regrets the error.